Get a grip on the ice with Celsius Ice Cleats! 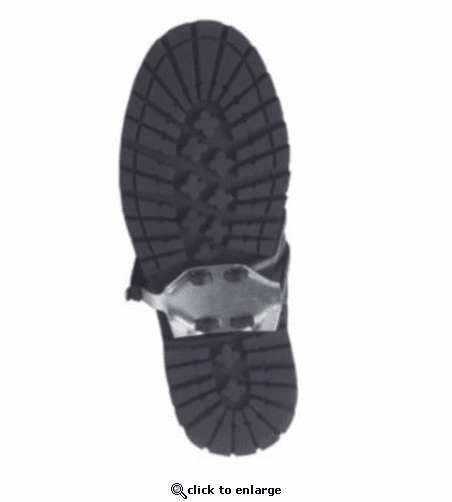 Their rust-resistant, lightweight steel spikes can be quickly attached or removed from any size shoe or boot for positive traction when out on the ice, snow or mud. Built with a tough rubber strap that slips over any shoe size, these Ice Cleats are great for people working outdoors. Prevent slips, falls and injury with this inexpensive traction device. According to the National Safety Council, the total cost for each lost workday can be in excess of $30,000! Injuries caused by slips and falls are the third largest cause of workplace injuries according to the Bureau of Labor Statistics. Injuries caused by slips and falls are the single largest cause of Emergency Room visits according to the National Safety Council. I haven't actually used these cleats, they're a Christmas present for my daughter (she's living in Alaska now, experiencing her first winter in a cold climate). I used to have a set of these years ago while in the military in Europe. Never once slipped on the ice.